In a week where most take time away from work to be with family and many grieve the violent colonization and genocide of First Nations peoples on this continent, there is work we can do and actions we can take to bring justice and wholeness to the Portland metro. For the short term: Join us at a Black Friday rally at Nike Headquarters to demand that corporations pay their fair share of taxes! For the long term: Begin the conversation about how to prevent gerrymandering here in Oregon to ensure that we do not fall prey to one of the most destructive electoral crises of our day! And, finally, a centuries long term corrective: While we do not include fundraisers as part of our Action Alerts, this week we invite you to take up a reparations practice I’ve had for years. Join me in taking a small step towards responsibility for our history. Donate to a local or national Native American organization of your choosing. Tell Nike on ‘Black Friday’ that Corporations must Pay Their Fair Share! While schools have been underfunded for years due to our state budget shortfalls, corporations in Oregon continue to pay some of the lowest tax rates in the nation. Remember when Nike was granted a special legislative session when they threatened to leave the state if they didn’t get their tax deal extended? 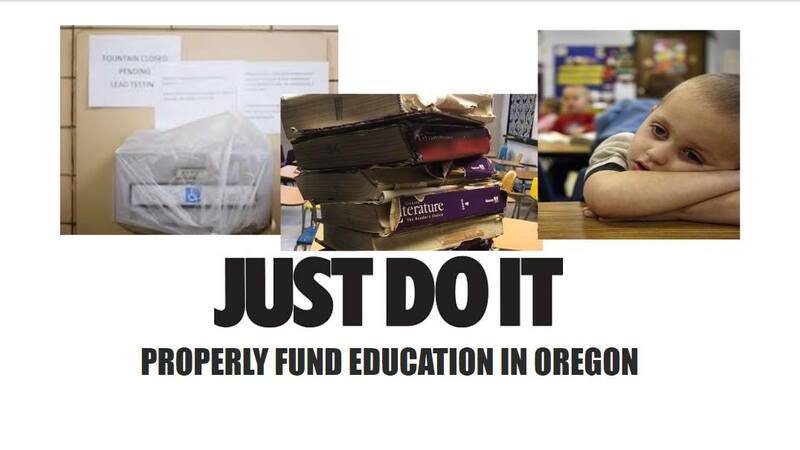 Join Oregon Public Employees United and JwJ for a protest outside the Nike store in downtown Portland on Black Friday, November 23rd to educate the public about this important issue. What should our priority in Oregon be, kids or corporations? Come out to demand that corporations pay their fair share. Please join the League of Women Voters of Portland when we tackle a big issue – gerrymandering. The 2020 U.S census is coming and so is the 2021 redistricting process. Come to this forum to learn about problems in our redistricting process now and how to fix them. Join the Movement to Prevent Gerrymandering! We’ll talk about our current process, how it affects elections in Oregon, and what reform could look like. You can learn and ask questions about a new way to allow voters to elect representatives who truly represent the will of the people in their district. The League wants to put the process of redistricting back into the hands of voters. We believe voters should be choosing their representatives—not representatives choosing their voters. We can do this by amending the Oregon Constitution to create an independent redistricting commission. Guest Speaker: Candalynn Johnson, LWV of Oregon Redistricting Reform Campaign Coordinator, will talk about why the League supports reform. For questions about the forum please contact Candalynn Johnson, at Candalynn@lwvor.org. You may also visit the redistricting reform website at: www.redistrictingmatters.org.